Lately I’ve been thinking about the miraculous nature of backyard chickens. They are lovely to see, fun to hear, and all their waking hours they convert stuff you can’t eat into stuff that you can. I can’t keep mine loose because we have a large tribe of local coyotes, but every time I walk by their roofed yard and hear the pleasures and squabbles of chicken life, I feel better. 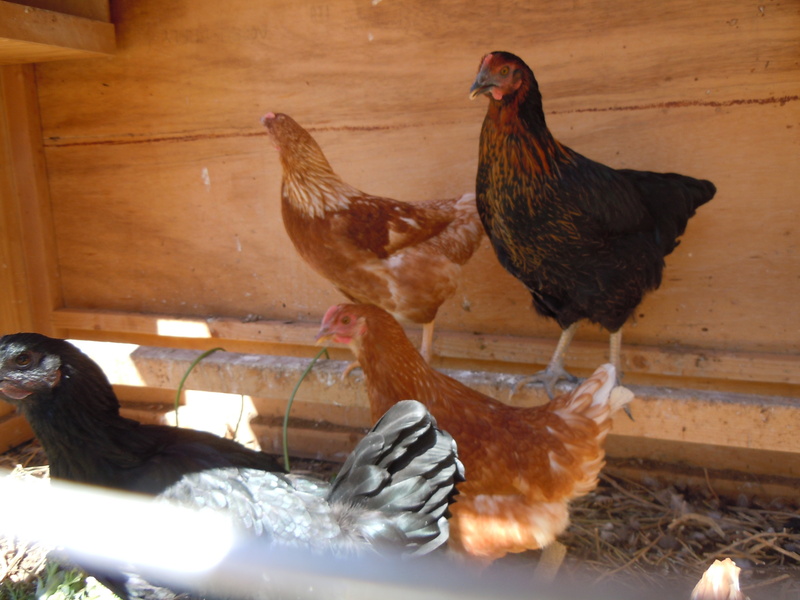 Chickens fit easily into nearly every backyard and enrich soil, nutrition, and QOL. Then there are the eggs. 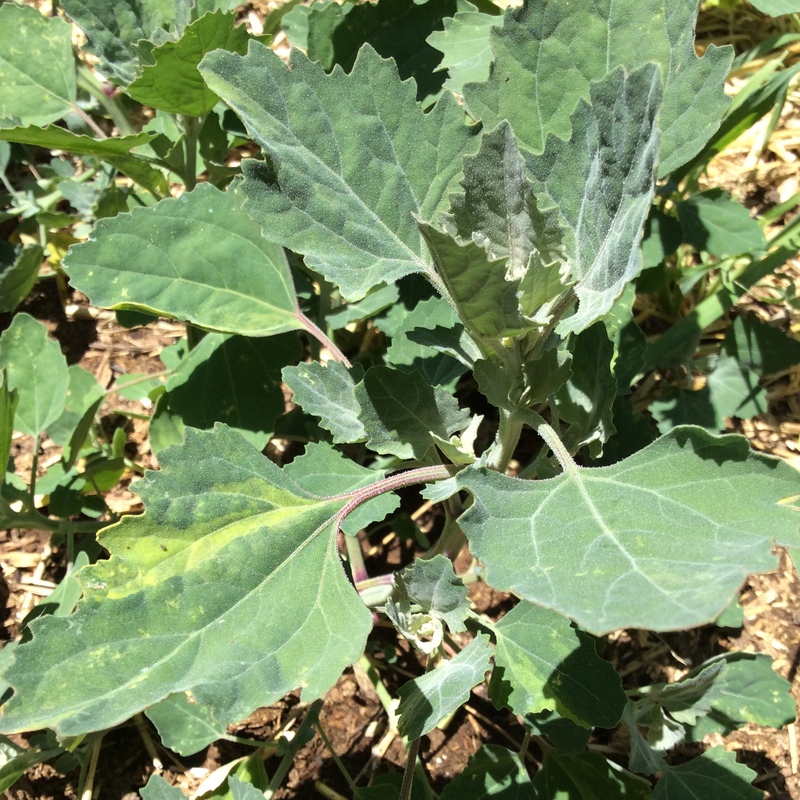 I feed my chickens a ton of fresh alfalfa and other green stuff in the summer. This time of year, their diet includes dandelions, mustard leaves, kale, and grass. 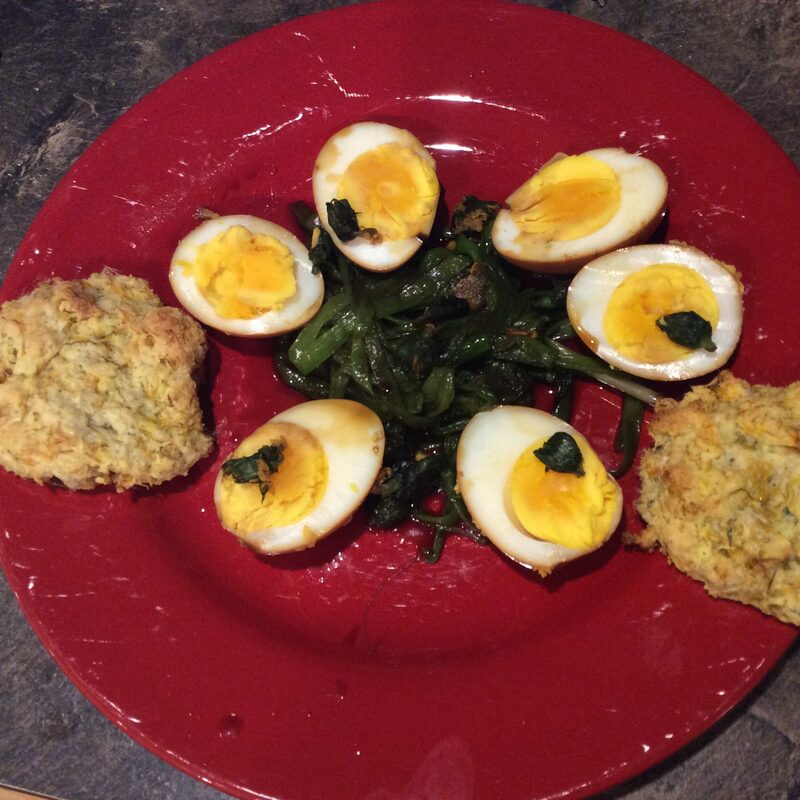 The yolks are a glorious deep yellow and they are very delicious. I’m fond of eating them hard-boiled for snacks, often just shucked out of their shells while still warm and eaten with salt and pepper. Sometimes I want something a little more elaborate but not much, and that’s where an egg salad sandwich tastes just right. 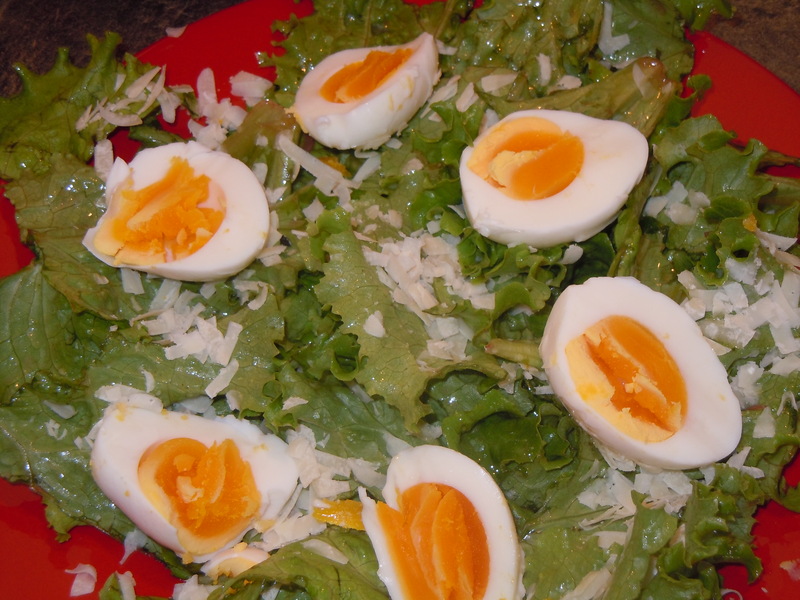 It can be made in less time than it takes to read about it if you keep some hard boiled eggs in the refrigerator. You will also need bread, mayonnaise, and some herbs. My sandwich is a display of what eggs can do, because the base is a low-carb flatbread based on eggs and flaxseed and the mayonnaise is my homemade type. 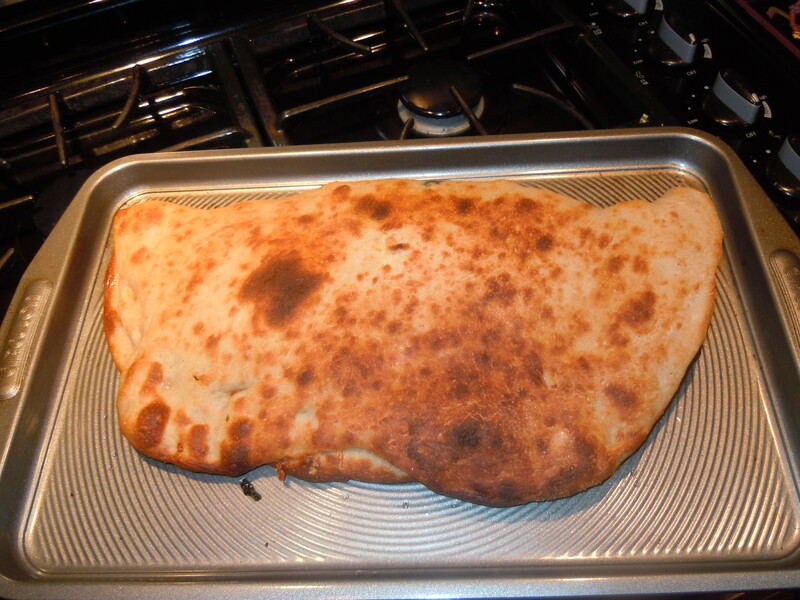 But you can use Hellman’s and any bread of your choice. 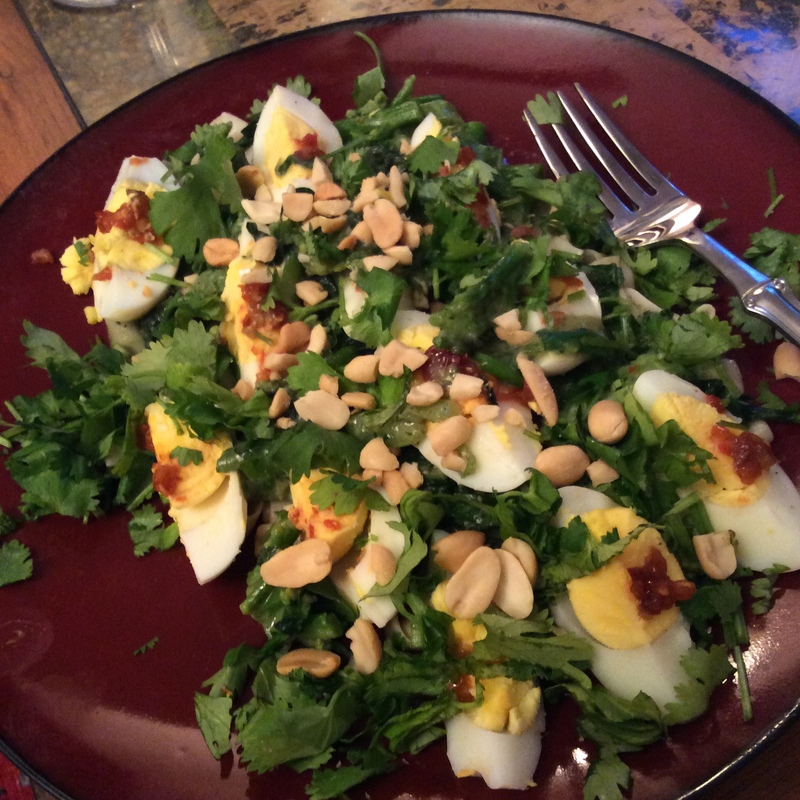 Egg salad can be elaborated with all sorts of stuff in it, or it can be a couple of tablespoons of mayonnaise with a small handful of suitable herbs snipped in; I used tarragon, green onion, and garlic chives in about equal quantities. 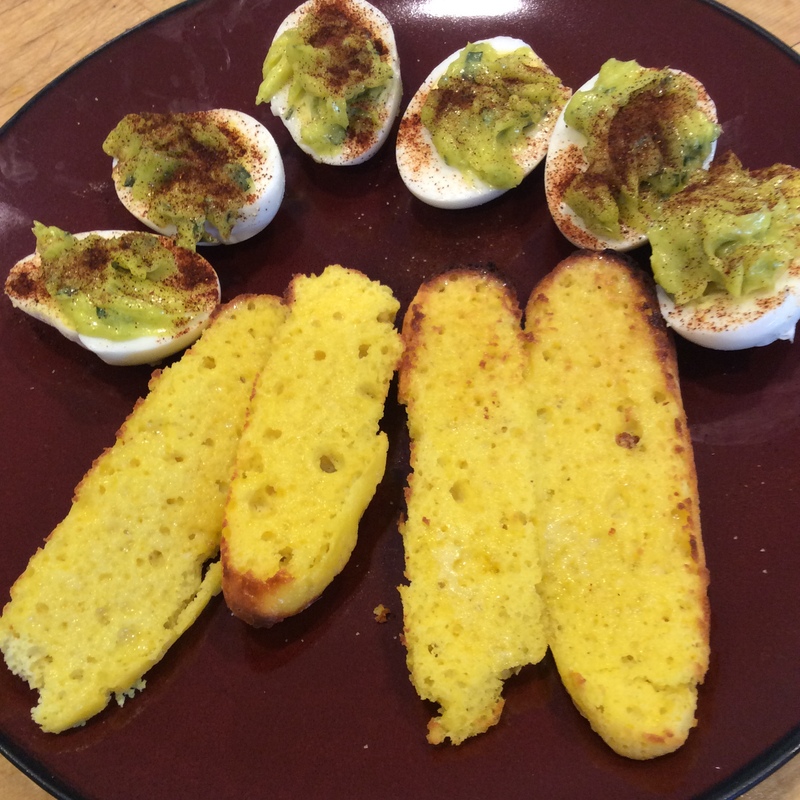 Slice in two hard boiled eggs, stir and mash, and spread on the bread. 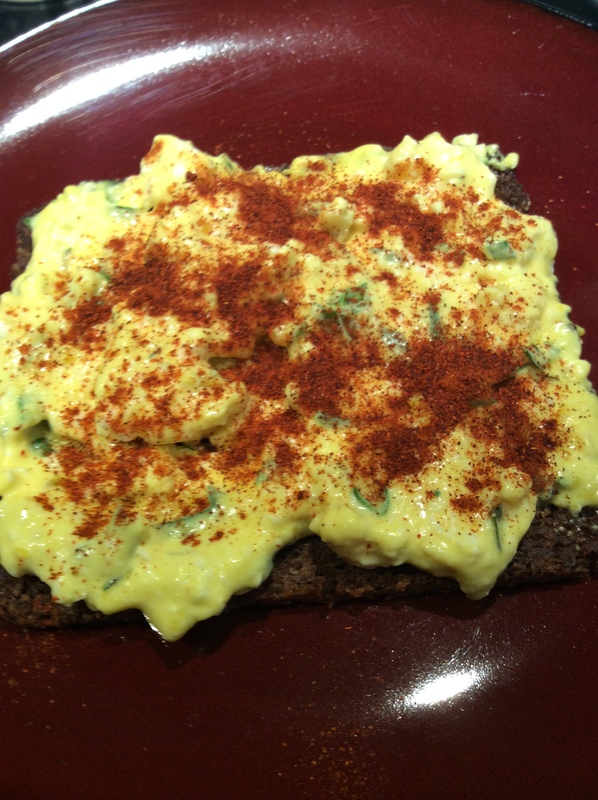 I think it isn’t real egg salad without a lavish sprinkle of powdered chipotle chile on top, but use paprika instead if you prefer. So my real point is, find a source of great eggs and eat them. 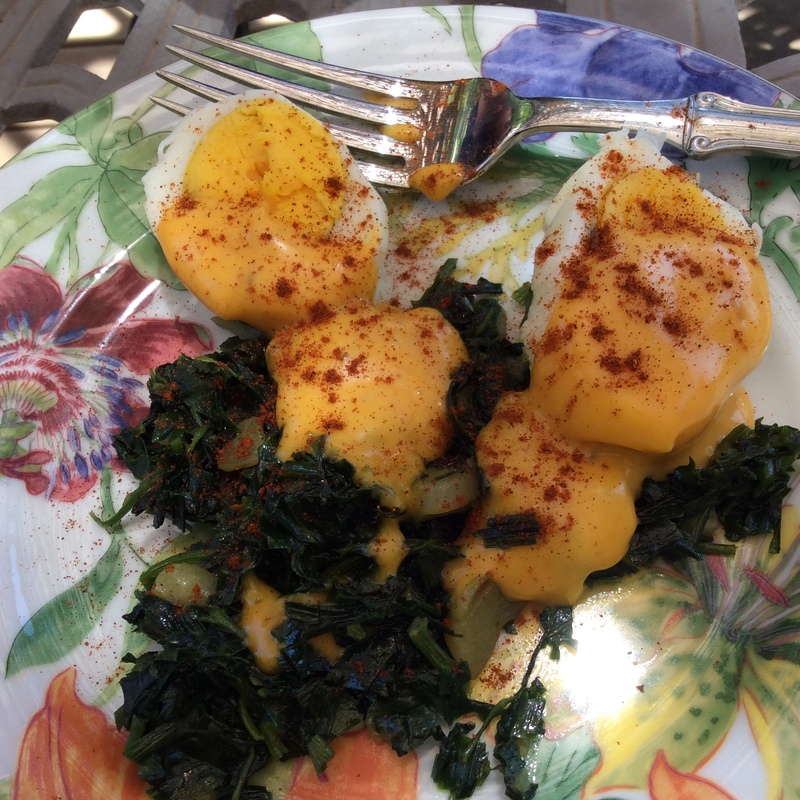 Even the best eggs cost, at most, about 50 cents each, and they will make you healthier and simplify your life. If you hard-boil a dozen at a time, they are always waiting to be converted into egg salad, or other types of salad, or deviled. Asian salads with lots of herbs, some lime and fish sauce in the dressing, and a sprinkle of peanuts are especially good. I love them sliced on top of a Thai jungle curry, or as the center of an Indian dish made by forming a large meatball of spiced meat around a hard-boiled egg and frying it. 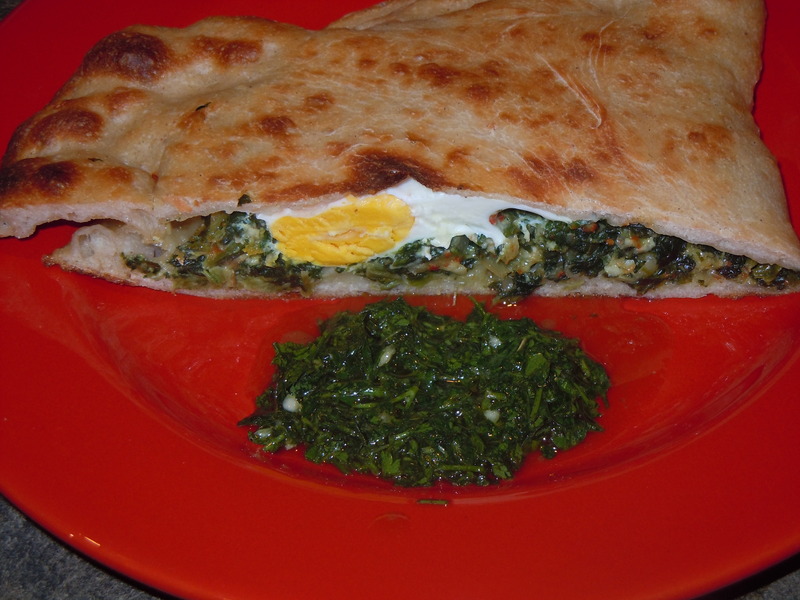 I can recall making a Mexican dish twenty years ago that involved soft corn tortillas filled with a green toasted pumpkin seed pipian and sliced hard-boiled eggs. 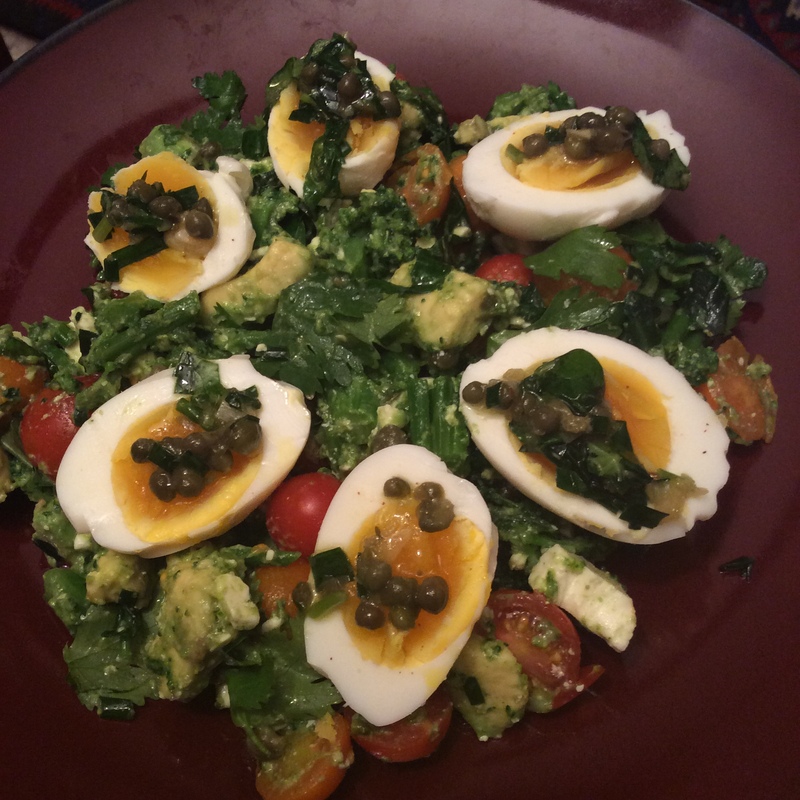 I can even imagine making the basic egg salad above and plopping spoonfuls of it on very good crackers with some chopped kalameta olives or even caviar on top, as an easy and delicious appetizer. 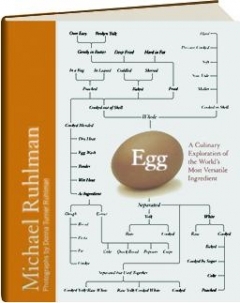 If you need more ideas, there is a marvelous cookbook by Michael Ruhlman simply called “Egg” that every eager cook should read. (13) ducks, geese, chickens and other poultry. Therefore, existing laws about chickens permitting us to keep up to fifteen chickens (only 1 rooster among them) prevail. Thank goodness, because there’s nothing like those fresh warm eggs. 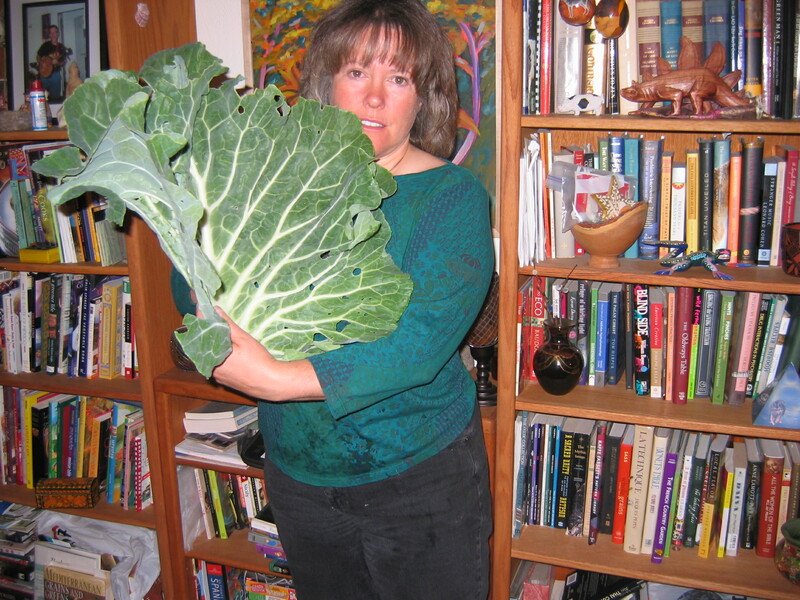 Every year I try a few vegetables that I haven’t tried before, and for 2009 one of the clear winners was Tronchuda, a giant non-heading cabbage from Portugal. I grew only one plant, and it ultimately reached over four feet across, with leaves almost 2 feet from side to side. The leaves were pleasant to eat cooked at any point, but especially good after a few frosts. I used it in the same ways as collards or kale, and also made a soup with sauteed onions and garlic, Spanish chorizo (not the Mexican soft chorizo,) good chicken broth, salt to taste, and chopped tronchuda, all simmered together until the tronchuda tasted good. By the way, this is an overlooked method for determining when green leafies are sufficiently cooked: keep tasting them, and when they start to taste good, they’re done. I will definitely be growing it again this year, and that’s the real test of any vegetable: is it worth the garden space? Tronchuda delivers. I’ve read that the wide white leaf ribs can be cooked as a vegetable in their own right, but I didn’t care for them and composted them instead, keeping the green parts and the narrow ribs to cook. I recommend it highly for any garden. You can get seeds at Nichols Garden Nursery, a wonderful source for all sorts of odd delights. Our own New Mexico seed company, Gourmet Seed International, offered seeds for two of my new experiments, rampion (the famous “rapunzel” of the fairy tale) and bladder campion. I’ll keep you posted. 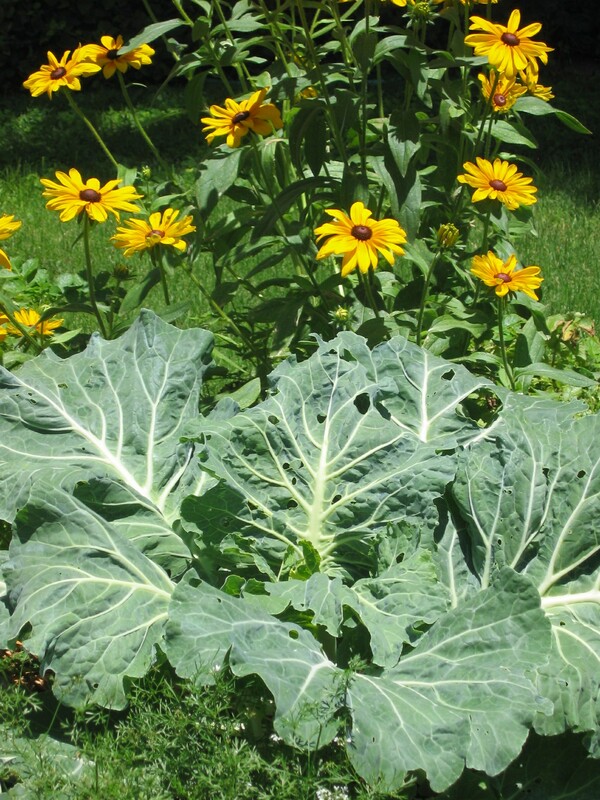 This is the time of year to plan your homestead garden and order what you need. I’m dealing with a brand new property with no planting in place, so I’ll be starting a new mini-orchard, and I would highly recommend dwarf fruit trees for eager would-be urban homesteaders. They produce relatively quickly, look charming, and allow harvesting with feet planted firmly on the ground. Every yard-farm should reflect what the owner and family like to eat and drink, and with this in mind I’ve decided to plant wine grapes. It will be a few years before I’m making my own wine, but the thought of my very own mini-winery has already given me a lot of pleasure and the vines aren’t even planted yet. In anticipatory value, it’s the best garden bargain I’ve had, and this may be the most overlooked benefit of urban homesteading; you spend so many happy expectant hours. The same applies to my backyard chickens, which are not yet purchased but are already clucking quietly in the back of my mind. By the way, if you have any interest in adding livestock to your homestead, it’s worth reading Farm City . Author Novella Carpenter created a little squatter farm in Oakland, and it isn’t what most of us would want, but her descriptions of raising and killing animals for meat are accurate and unromantic (but reverent.) If you have never harvested meat animals, this is a test. If you can’t stand to read her descriptions, you probably don’t want to go into livestock. If you do go on to raise a little of your own meat, I can guarantee that you will no longer allow meat to be wasted. Once you really understand where it comes from, waste is not an option. On the other hand, you will understand the fascinated reverence with which good farmers and hunters view meat animals.